Will the GMO industry's investment in Maine politics be enough to overcome the support for making Maine the first state to require GMO labeling? Over the last several years the Maine Legislature has considered a number of bills relating to genetically modified agricultural products. Many of those bills have addressed the question of whether food products containing genetically modified organisms or "GMOs" should be labeled as such, ensuring public access to information about genetically modified ingredients in the food stream. Currently, sixty-four countries have laws mandating the labeling of GMO foods. The American public appears to strongly support GMO labeling, with nationwide polls showing 80% to 90% in favor and only a small percentage opposed. At the federal level, the bipartisan Genetically Engineered Food Right-to-Know Act was recently introduced in the Senate and House. For the moment, this public support seems to be translating into legislative momentum. No state has yet enacted legislation to require GMO labeling, but bills are under consideration in 20 states this year. In the current Maine Legislature the principal GMO labeling bill (LD 718) has garnered 123 cosponsors — two-thirds of all sitting Senators and Representatives. But if history is any guide, public support for GMO labeling does not ensure enactment of LD 718. Prior to 2001 the legislature rejected three GMO labeling bills3. In 2001 proponents of labeling, including environmental, consumer, and certain agricultural interests, made a major push but met stiff opposition from businesses such as food manufacturers, biotech companies, and seed and herbicide manufacturers. The GMO labeling bill introduced in 2001 was defeated. 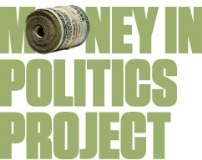 One reason for the difficulty in enacting such a popular measure may be the financial clout of labeling opponents and their overwhelming advantage in campaign contributions. These campaign contributions are intended to shape the legislature to be more favorable to their positions and/or to gain and keep access to lawmakers. 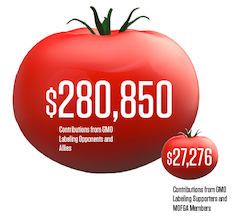 This report reviews some of the campaign contributions given by the two sides in Maine's longstanding GMO labeling debate. This is only a snapshot of records from the Ethics Commission's database, but it reveals the role that money can play in advance of important, high-profile legislative debates.